We decided to change our front door lock and handle to a keyless entry system. Basically, it’s an electronic keypad instead of a standard key lock. It’s a great system when you have kids coming and going at different times of the day – no more lost keys! 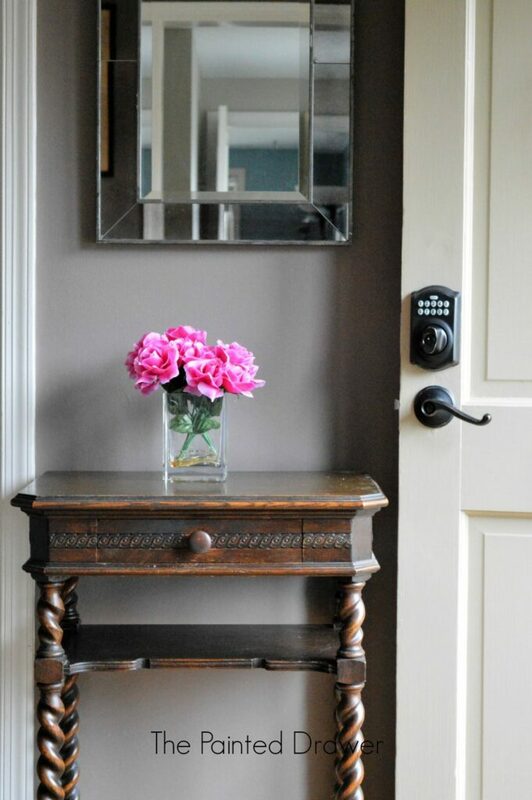 My husband purchased a Schlage Keypad Deadbolt and door handle in the aged bronze finish. He installed it without too much difficulty. The only issue was using a drill bit to make the opening slightly larger for the new lock. 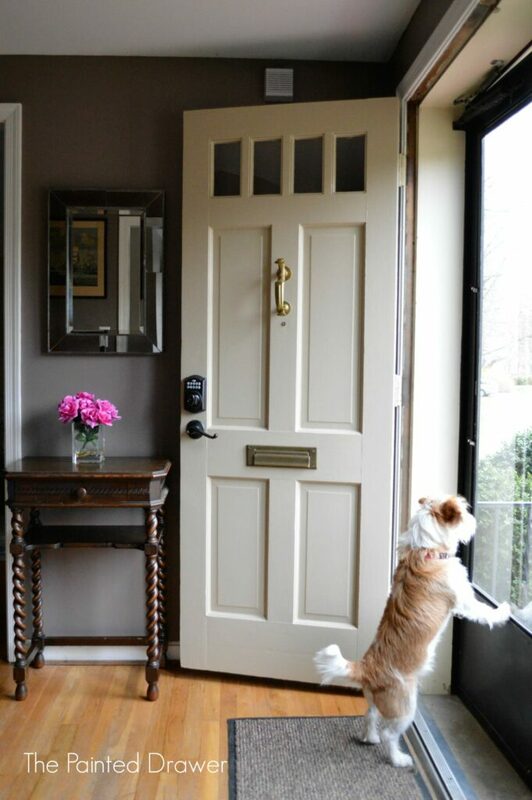 Here is where owning an older home always turns a somewhat easy task into a difficult one. 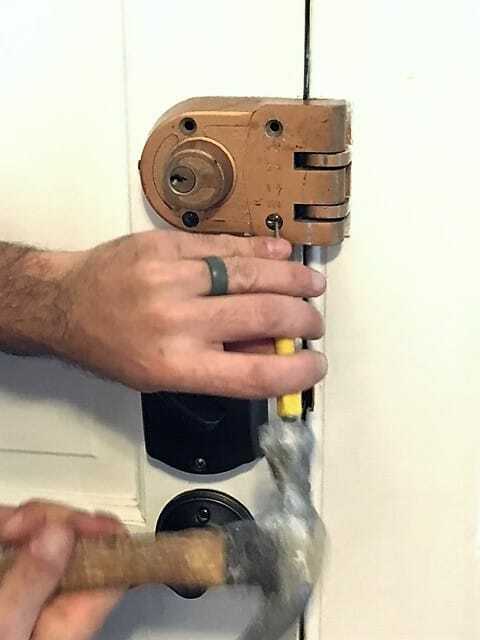 I’ve been wanting to remove an old deadbolt from our front door for years and once we installed the new lock, it really had to go. 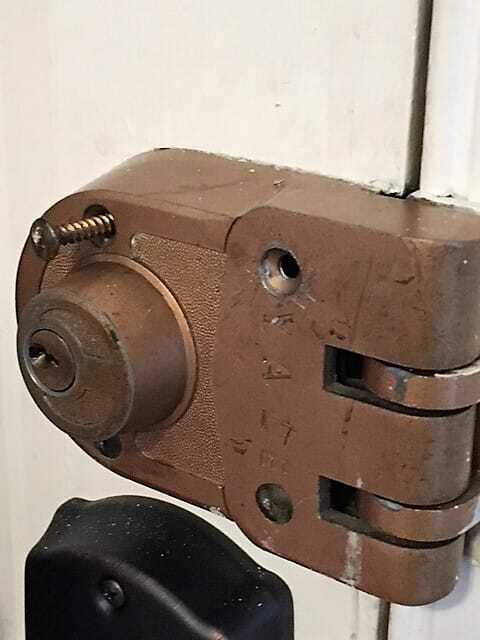 The old deadbolt was huge and ugly and we never used it. When my husband went to unscrew it, it would not budge. The screws were one-way screws – I had never heard of those before! The are exactly as named – screws that are designed to only go in and not out. Great. 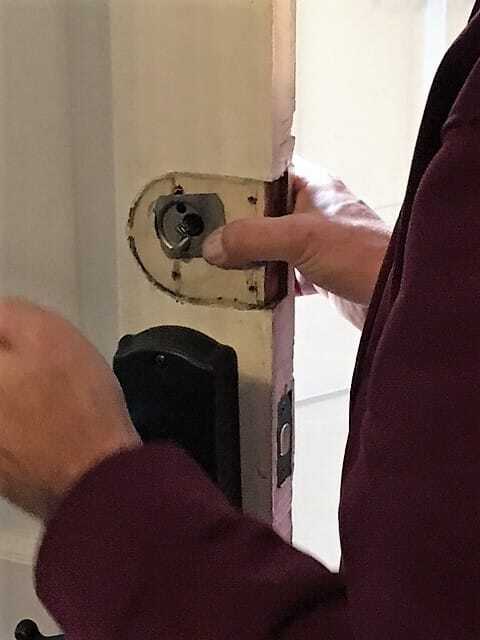 With a lot of effort (see video below from my YOUTUBE channel) we managed to finally remove the deadbolt. Now I need to fix and paint the interior side of the door. This will require more sanding and filling where that old nasty deadbolt was installed. Never ends! 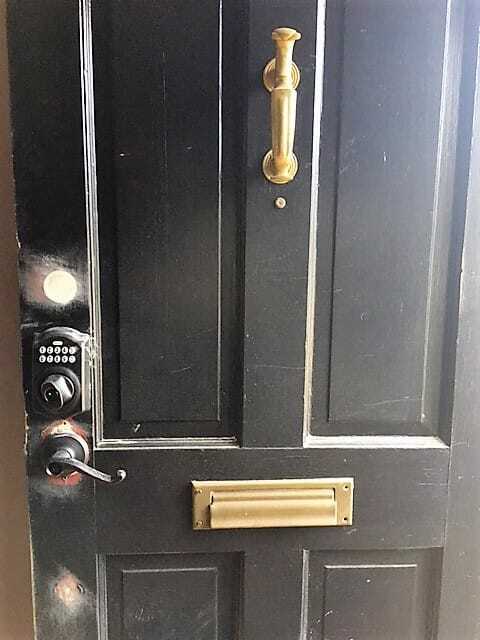 My son has been spray painting all of the shiny brass door knobs in his house. He is using Rustoleum’s Metallic Spray Paint in Oil Rubbed Bronze (they have other colors). He lightly sands the knobs and hinges; primes; then paints them. They look fantastic! Go for it! Looks good to me! Remember, isn’t it perfectly imperfect? That is SO true! And, my husband will not want to replace his newly finished project lol! 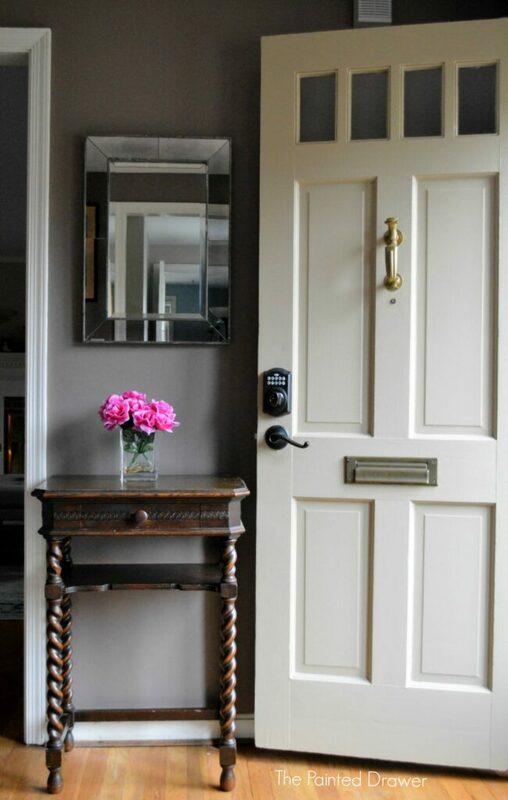 I spray painted our door hardware with Rustoleum’s Oil rubbed bronze. I cleaned the pieces first and then painted. I’ve never had to touch them up. 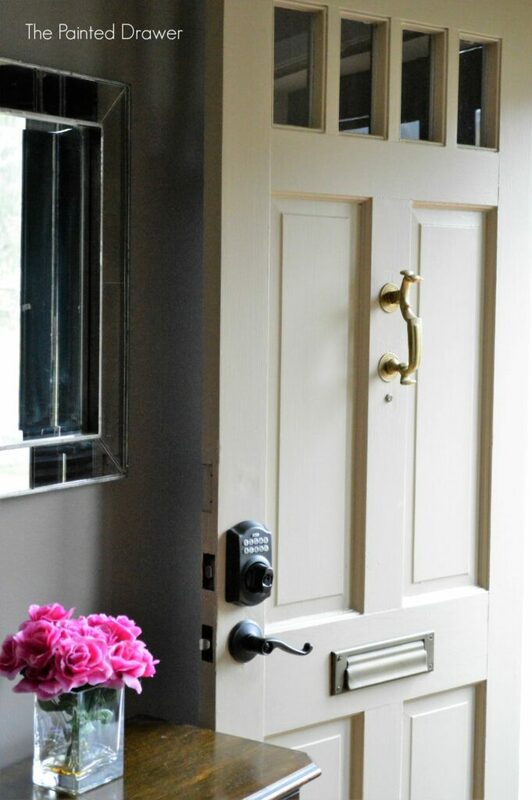 I would spray paint the mail slot hardware to match the handle. I don’t think the door knocker has to match.